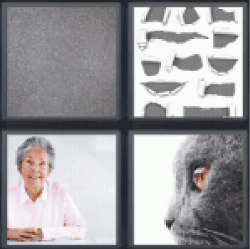 4 Pics 1 Word Old lady. Cat face. Broken wall paper. Granite. Thanks for visiting 4-Pics-1-Word.com, here are the cheats for your favorite game. 4 Pics 1 Word Old lady. Cat face. Broken wall paper. Granite.